The procedure called All-on-4 Dental Implants®, commonly known as Teeth in a Day, is the smile solution for those who lost all their teeth, who are suffering from poor broken teeth, or who have poorly fitting dentures. Traditionally, the method of choice for replacing a full arch of missing teeth was dentures. These are still a common method today, and although advances in technology have improved the appearance of dentures, they do not provide the function and security that All-on-4 dental implants offer. Disadvantages of dentures include slipping or falling, which can cause embarrassment, causing sores on gums, and needing to be replaced as bone shrinks over the years. This safe revolutionary treatment provides you with a fixed restoration (non-removable) often in just one day. The treatment is designed to utilize only four dental implants to secure your permanent teeth, and this technique has changed the lives for many individuals. If you’re interested in receiving All-On-4-Dental Implants in Dallas, TX or Garland, TX, call to schedule a consultation today! The All-on-4® procedure has grown in popularity among individuals in need of secure dentures. Studies have proven good long-term success over the past 15 years. Incorporating titanium alloys and CAD/CAM technologies (computer-aided design), we are able to provide patients with an affordable, safe, comfortable, stable and healthy treatment alternative when compared to other treatment options. The “All-On-Four” requires significantly shorter treatment times. If you are in need of just one arch of teeth, that is an option with this treatment. A new patient begins the Teeth-in-a-Day procedure with a comprehensive consultation (one hour or 90 minutes) including X-rays. The treatment process requires a case work-up, a CT scan, and fabrication of the prosthesis (new teeth). The surgical implants placement and securing of the new teeth are then completed under sedation in the same day. After the healing period (3-4 months), the final restoration is constructed and attached permanently. Three yearly maintenance appointments are required thereafter, to ensure long-term, healthy and successful treatment. What is the post-op protocol? It is hard to describe or predict an individual’s feelings. However, many of our patients have described it as a life changing experience. Before the procedure, the patient is often wearing annoying, removable dentures or suffers from badly broken teeth. By the end of the procedure, they leave with a beautiful smile, extremely happy and excited about life again. It is truly a life changing experience! What’s the difference between Implant Dentures and All-on-4 Dental Implants®? Dental implants are specially machined titanium roots, designed to be installed into the jaw, as a replacement for the root of your teeth. 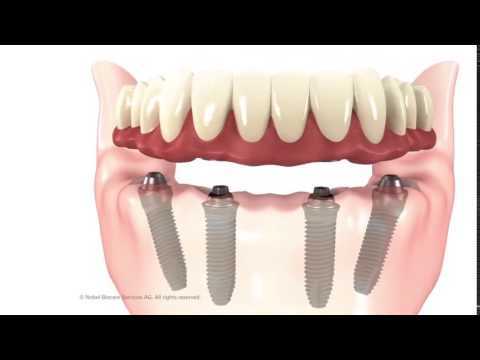 The implants can be utilized to support one or multiple teeth. Removable denture can be secured with implants. Specialized attachments that are designed to stabilize your denture during chewing, function and smile can be used as a solid anchors for removable dentures. It generally only takes two-four implants to stabilize a removable denture. Implant dentures can dramatically improve lives when transitioning from a conventional removable denture to a secured and stable implant denture. Implant dentures also enhance your chewing efficiency, other oral functions and confidence. Modern day dental implants have a high success rate. With proper diagnosis and treatment planning, risk factors are significantly reduced, but implant therapy must entail a consistent maintenance schedule thereafter. Am I a candidate for the All-on-4 Dental Implants®? The ideal candidate for this type of procedure include patients who have lost all or most of their natural teeth, patients who are currently wearing removable dentures, for those who are suffering from many badly broken or diseased teeth. Age is not a factor for being a candidate for this procedure, so long as you are in good health. "Actually I remember that pretty vividly, coming in the door for the first time because immediately I felt comfortable, I felt at ease and I felt like I was with people who really cared about my being here. They didn't feel like strangers. From the get-go they felt like people that I already knew, people that I already had a relationship with. And it was kind of a cool position to be in."